Few and far between are the weeknights I have time to cook a meal at home. I work full time and run straight from work to school on Mondays, Wednesdays and Fridays. The other two nights I catch up with girlfriends or attempt to check off an endless to-do list and by the time I make it home, I am too tired to move, let alone cook. The thing is, I am one of those peculiar people who gets energized from being in the kitchen. I know that if I can just get started on something, I will catch my second wind and be left with a delicious, often affordable and usually healthy dinner. In order to increase the likelihood that I will get cooking on the rare night I find myself at home, I am always on the lookout for simple dishes (love a good stir-fry or fried rice) or a dish that has me doing most of the prep work ahead of time, on a weekend, when I have more time. This is known as being a Sunday cook. If you are looking to expand your Sunday cook repertoire, try these Thai-inspired turkey meatballs. They were the result of a recent Sunday project that kept me well-fed on Tuesday nights for an entire month. The recipe itself is more an exercise in mixing than cooking, but having a bag of these frozen meatballs in the freezer meant I was never more than 15 minutes away from an easy, home-cooked meal. Simply thaw a few of the meatballs in the refrigerator overnight, or use the defrost setting on your microwave if you are pressed for time. Add a bit of canola oil to a small sauté pan and cook these up over medium heat. They make a great addition to many dishes—think soups, stews, pastas, or my favorite application, over a bowl of wheat berries with a poached egg—or just serve them on their own with a salad on the side. Place the ground turkey in a large bowl. Cut the scallions in half lengthwise and thinly slice white and light green parts only. Place the dark green sections in your freezer bag for collecting vegetable scraps for stock. Add the chopped scallions to the turkey. Mix the fish sauce, Sriracha, sugar and garlic in a small bowl. Add the fish sauce mixture to the ground turkey, along with the cooked barley, and mix gently. I prefer to wear disposable gloves and mix with my hands, just until combined. Place a piece of parchment paper on a cookie sheet. Shape the turkey mixture into meatballs of your desired size and place on the cookie sheet. Cover with plastic wrap and freeze until solid. 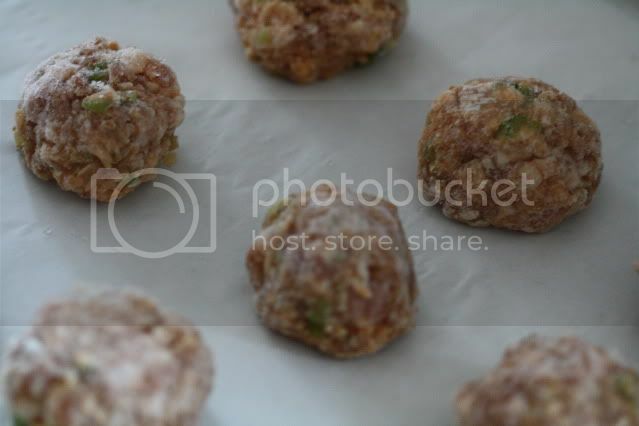 Transfer frozen meatballs to a Ziploc freezer bag and use as needed. Those sound a nice twist on a favorite around here. With our weird work schedules, I'm often cooking at 3 in the morning. I am also a Sunday cook :-) The kitchen rocks my world on Sunday(smile). These meatballs look delicious. Such a great idea to make meatballs and then freeze them!!!!!! Ahh I've been craving them lately. Have to give a Thai version a try. Sounds super yummy. Just need to discover where to find zip lock bags in france! I like the combination of Asian flavors and the addition of barley. I'm going to file this away for a weekend project. okay I want summa that sriracha sause stuff for christmas, please? also wanted to tell you I stopped for falafel today at San Vincente and La Ciengega and watched to Ecuadoran or Honduran cook making the falafel on this cool implement, long handle, top like a christmas tree with a disc under it, pats the falafel ingredients all around the top, then pushes the handle like a syringe into the fat and bingo, the disc pushes the falafel into the deep fry and onto the next one - not sure what I'm going to do with it but I want one it was just so clever! You really grabbed my interest with "over a bowl of wheat berries with a poached egg"--yes yes. They look so delicious! Very delectable and are prepared quickly. Yes, I am also one of those energized by time in the kitchen. These meatballs with their Thai flair look excellent and great idea to have them in the freezer ready to go.